The belief that 40-45 percent of your body heat is lost from your head has been debunked – in reality, it’s closer to 10 percent – but it’s still important to keep your noggin warm during the winter months. The AEO Metallic Knit Beanie, which is on sale at American Eagle for $11.99, combines fashion and function with its slouchy fit and eye-catching metallic sheen. For a more weather-resistant hat, check out the Power Stretch Beanie at Eddie Bauer. It’s on sale for $19.99 and features wind- and abrasion-resistant Polartec fabric. If you’ve gotten caught in cold or windy weather without a scarf, you know how much you miss one. Don’t let your neck go exposed- invest in a thick scarf like the Chunky Cowl Scarf from Gap , on sale for $31.46. The REI Rib-Knit Cable Infinity Scarf is another good pick at $37.93. It’s extra-long, so you can loop it around your neck multiple times. Before you step out into the cold, put on a pair of gloves to keep your fingers toasty. 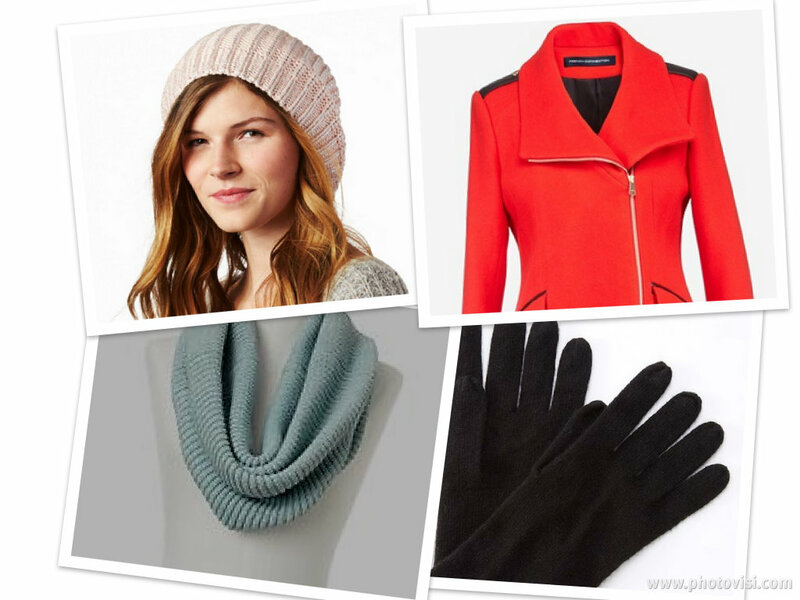 These luxurious Cashmere Short Gloves are on sale for $54.99, and Ann Taylor is offering an extra 50% off on all sale styles. If you prefer keeping your fingers free, these exquisite Dyani Arm Warmers from Anthropologie will still keep your arms and palms warm. They’re on sale for $59.95. A sturdy, warm coat is your best friend in cold weather. Check out Burlington Coat Factory for great deals on name brand coats. For example, the Herringbone Belted Coat, which usually sells for $160, is just $79.99 right now. French Connection has a significant number of coats on sale right now, too. The chic Tulip Coat with Leather Trim offers a pop of color for $299.99, down from $325. Lastly, if it’s maximum warmth you seek, take a look at the Annapurna Jacket, which features lightweight, compressible PrimaLoft One insulation. It’s on sale for $132.93 at REI. Now that you’ve had a few days to digest all of the turkey, stuffing and pie, it’s time to move on to the next order of business: taking advantage of all of the great Cyber Monday deals! There are few things we at Shopilly love more than a good sale, so we’ve rounded up some of the hottest deals from our favorite brands for you. Check them out below, and happy shopping! Casual apparel brand Aeropostale is offering up to 70% off everything, plus free shipping on orders $75 and over. For the ladies, we love the delicate lace work on this peasant top, now $22.25. For the fellas, this donegal cardigan provides a lot of class for just $29.75. “Everyday Design” retailer Fab is a great place to find inventive, quirky stocking stuffers, and right now it’s offering 30% off sitewide (note: a few brands are excluded from this promotion; see website for details). How fun are these fingerless heart gloves and triceratops cufflinks? And if you pick out $200 worth of stocking stuffers, you’ll get $30 of Fab credit to use by December 16. For the outdoor recreation buffs, REI is wishing everyone “Happy Holi-Deals!” with an extra 30% off one item at its online outlet store. Visit REI-outlet.com by 11:59 pm PST tonight to take advantage of this deal. If holiday travel has wreaked havoc on your luggage, fear not! TUMI is offering 30% off full price T-Tech products like this lightweight large trip packing case, originally $545 but now $381.50 with discount. You’ll also receive free shipping. ‘Tis the season to be merry- especially since you can save 10% on your purchase of 6 or more wines on wine.com. Mix and match your favorites and enter the promo code MAKEMERRY at checkout. If you’ve already stocked up on wine but need accessories like wine glasses or decanters, use the promo code BESANTA to save 20% on your purchase. Cheers! The countdown to one of the most polarizing holidays continues – we’re a mere 3 weeks away from the simultaneously beloved and reviled Valentine’s Day. Whether you love it or hate it, Valentine’s Day can be a stressful holiday due to the number of romantic expectations it brings, so we’re here to dispel a bit of your stress. Allow us to make some Valentine’s Day gift suggestions for the special male in your life! If you were one of the brave souls who headed out in the wee hours of Black Friday (or even shortly after Thanksgiving dinner) to take advantage of the sales, our hats are off to you. If you chose to sleep in or just prefer shopping from the comfort of your couch, it’s not too late to catch up now – it’s Cyber Monday, after all! Open anyone’s closet, and you’ll encounter a world of colors, patterns, fabrics and fashions. Rather than taking a (risky) stab at pinpointing a person’s style preferences, give him or her some peace of mind in the form of closet organization. The Container Store offers a plethora of closet organizers – the Milano 6-Compartment Hanging Sweater Bag keeps those pesky shoulder bumps caused by hangers away. Target sells a convenient Tie and Belt Hanger that keeps accessories organized, and for the jetsetters in your life, a GarmenTote Garment Bag (available via Bed Bath & Beyond) keeps dresses and suits wrinkle-free. Thank your go-to tech expert for all of the times he or she saved your computer/phone/life with a cool accessory for his or her latest gadget. Amazon carries Speck’s line of eye-catching, protective and budget-friendly iPhone cases. A pair of Klipsch Noise-Cancelling Headphones from Brookstone is sure to make any audiophile’s ears happy, and Nike’s Jordan Gadget Gloves make it easy for your tech lover to fiddle with a touchscreen without risking frozen fingers. ‘Tis the season for good food, and lots of it. Treat your beloved gourmand to some seasonal delicacies. Williams-Sonoma makes a fantastic Peppermint Bark, and its Italian Food Lovers Gift Set makes throwing together a good pasta dinner easy as 1-2-3. Cheese enthusiasts will appreciate one of Sur La Table’s many cheese samplers, and Wine.com makes it easy to ship a good bottle or two to any holiday table. Nothing gets in the way of this person’s fitness goals – neither rain, nor snow, nor sleet, nor overconsumption of holiday treats. Guarantee that your athlete doesn’t get caught in the elements unprepared. A proper baselayer is key for retaining body heat, and Patagonia has a good selection of baselayers for women and men. For those below-zero days when leaving the house seems like a workout in and of itself, your athlete can still get a good workout in with a video like Jillian Michaels: Ripped in 30 DVD, available from Gaiam. Lastly, the REI Outdoor School offers a wide selection of programs and classes for budding and experienced climbers, cyclers, kayakers and more. When displaying your artist’s work on the refrigerator just doesn’t cut it any more, show your appreciation with the gift of framing. Art.com’s Photos [to] Art program allows you to upload a photo and customize it into a work of art, such as a poster calendar, canvas print or mounted photograph. For the crafty, Papyrus does custom printing, so your artist can design and print his or her own stationary and cards. Lastly, Z Gallerie has a wide selection of art, and if you purchase a piece and enter the promo code GIVE20 today, you’ll receive 20% off your purchase. P.S. Is holiday shopping already causing your wallet grief? Here’s your chance to win $700 from Shopilly – invite your friends to join Shopilly by December 11th, and you’ll receive 5 entries into the holiday giveaway per invitee! Details here.